These are not your father’s Clippers. The same pathetic franchise that refused to pay anyone that was worth a damn. The same franchise that enjoyed only one winning seasons over the prior seventeen before Chris Paul arrived. At least for now, owner Donald Sterling cannot be looked at as cheap. Unwilling to win. Today, he looks like an owner who wants to win. As strange as that may sound. 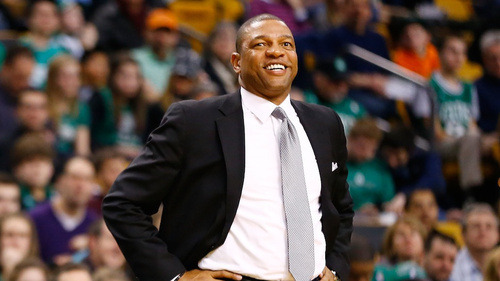 The Clippers were able to get Doc Rivers from Boston without giving up any personal assets. An unprotected first-round pick in 2015, which barring injury, should be around 25th in the draft. Now with Doc, Paul and Blake Griffin, the Clippers are in position to do some damage this offseason. Tradeable pieces like Eric Bledsoe and DeAndre Jordan still remain. It’s hard to tell what those two packaged together, or separately, can get on the market, but if that can fetch back an efficient secondary scorer on the wing, that could put the franchise in an unfamiliar position. As much as I personally dislike him, Danny Granger could be an intriguing get if he’s healthy. You hear rumors of an Eric Bledsoe package for Arron Afflalo from Orlando. Afflalo is obviously no star, but over the past three seasons, he’s averaged 14.7 points on 46.5% shooting and 37.4% from downtown in 34.4 minutes. As good as Jamal Crawford can be, his offensive is very erratic and probably shouldn’t be someone looked at as your number two scoring option at times. Not that Afflalo should necessarily be that guy, he’s a nice go-to option for Paul. Whatever the Clippers end up doing this offseason, with this hiring they’ll likely make their third straight playoff appearance for the first time since they were the Buffalo Braves in 1975. A new day in Clipper land.